Cannabis as a treatment for cancer is a conversation destined for debate. There’s a fine line between excitement for the promising research that exists and reckless speculation—particularly when it comes to the c-word, cure. The truth about cannabis’ applications for cancer lies somewhere in-between the claims of die-hard proponents and hardline skeptics: while cannabis has not been shown to be a cure for cancer, there isevidence to support its ability to help treat certain types of cancer. Research for cannabis as a cancer treatment began in 1975, when Albert E. Munson, a researcher and professor of pharmacology and toxicology at Virginia Commonwealth University, made a radical discovery. In an experiment on mice, Munson discovered that administering certain cannabinoids, like THC, inhibited the growth of a type of malignant tumour cells in the lungs known as Lewis lung carcinoma. It was a striking discovery—one that deserved immediate further research, this time with well-controlled clinical trials involving humans. But it was also a discovery made just years after former president Richard Nixon announced the U.S. government’s “war on drugs.” And so, it wasn’t until a few decades later that research into cannabis’ ability to suppress cancer cell growth began to surface in earnest. Most of this research came from other parts of the globe. In 2000, one such study from Complutense University in Spain found that administering THC in rats and mice “induced a considerable regression of malignant gliomas,” a type of cancerous tumor that occurs in the brain and spinal cord. With the discovery of what the study called the “anti-tumoral action of cannabinoids,” the authors speculated that cannabinoids could be a new therapeutic approach for treating—not all—but this specific type of cancer. These researchers weren’t alone, either. Another studyconducted in 2000 by the Institute for the Chemistry of Molecules of Biological Interest in Italy found that cannabinoids inhibited breast and prostate cancer cells from growing. Then, in a 2003 study on mice, the Center for Energy, Environmental and Technological Research in Madrid, Spain found evidence that cannabinoids could also be used in the treatment of skin cancer. A 2006 study from Complutense University substantiated these findings. This second study found that activating mice’s CB1 and CB2 receptors—which can be accomplished by consuming cannabinoids like THC—reduced the growth of melanoma, a tumor most typically associated with skin cancer. Research into cannabis’ ability to treat different types of cancer continued like this over the next several years. These studies found promising results for cannabis’ effect on all different types of cancer—from breast cancer to colon cancer to brain cancer. In other words, despite all of the promising data on cannabis’ ability to treat cancer in mice, virtually no well-designed trials for cannabis’ effect on cancer have been done on humans. “Do I recommend cannabis as an anti-cancer drug? Quite frankly I do not know. In many individual cases high THC, high CBD oil seems to work, but until we have seen good clinical work, there is a big, big question mark,” says Mechoulam. Aggarwal served on the editorial advisory board that, as of January 2016, made revisions to the United States’ National Cancer Institute website to include cannabis as a treatment for people with cancer. While the National Cancer Institute’s page on medical cannabis mainly speaks to cannabis’ ability to treat cancer symptoms (i.e. loss of appetite, sleeplessness, and nausea), it also includes citations from studies which demonstrate cannabinoids’ potential to inhibit cancer cell growth. Aggarwal says that one of the major barriers to cancer research is the simple stigma surrounding cannabis. Part of this stigma, he says, stems from a popular culture that has long painted marijuana proponents as lazy, stupid, and non-credible.Some of it comes directly from the U.S. government’s long and well-documented campaign to paint marijuana proponents as criminals and flat-out crazy. Some of it even comes from the wide-eyed claims of people within the cannabis community itself, where facts intermingle with fantasy and conspiratorial-sounding beliefs about the plant’s panacean properties are exchanged with fervor. “But the stigma is also structural,” says Aggarwal, referring to all the barriers to getting the necessary government approvals in the U.S. to study cannabis. This is why many of the existing studies into cannabis’ effect on cancer cells have been conducted in other parts of the world, like Spain and Israel. But other nations are not always free to break from the U.S. government’s hardline stance on cannabis either. The United States has long influenced international drug laws, pushing other countries to adopt similarly strict policies on marijuana and other drugs. 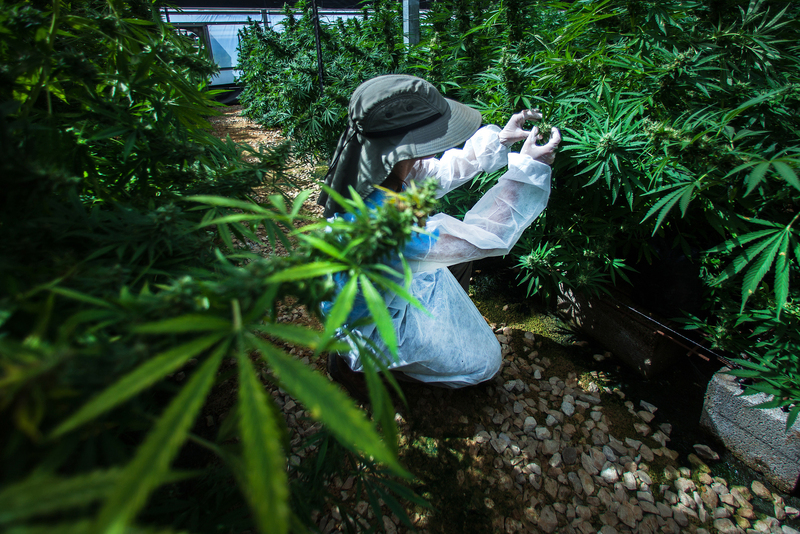 The U.S.’s influence on other countries’ drug laws was even felt recently in Israel—a country widely regarded as a leader in marijuana research—when a single phone call from President Trump persuaded Prime Minister Netanyahu to put a hold on Israeli cannabis exports which would have made it much easier for American researchers to conduct trials. Still, Aggarwal believes there is reason to be optimistic. He points to a 2017 study which he believes will set the stage for future research on cannabis’ effect on humans with cancer. This randomized double-blind and placebo-controlled study—the gold standard of trials in the medical community—looked at the effects of an oral cannabis-based medicine (containing equal parts THC and CBD) alongside the consumption of Temozolomide (an oral chemotherapy drug) on patients with recurrent glioblastoma multiforme (GBM), a type of brain cancer. While this study certainly doesn’t show cannabis to be the “cure” that some would hope for, these findings do give medical cannabis proponents a reason to be optimistic. Cannabis has, for years, been used to successfully treat cancer patients’ symptoms, such as nausea, vomiting, and pain. And now, it seems plausible that cannabis could be used to slow the progression of certain types of cancers too. At least, this is what the evidence would suggest. But unfortunately, so long as cannabis research is painstakingly difficult to conduct, a concrete answer about cannabis’ effects on human cancer cells will remain just that: a collection of compelling evidence, always suggesting, but never confirming promise. According to Bloomberg, Cronos worked with NASDAQ for six months to acquire approval. Despite the fact that cannabis is still federally illegal in the United States, the SEC is able to approve Canadian cannabis companies to be listed on the NYSE because they are technically operating within the legal limits of their home country. All times are GMT0. This page was generated at 07:49 PM. Powered by vBulletin Copyright Â© 2015 vBulletin Solutions, Inc.